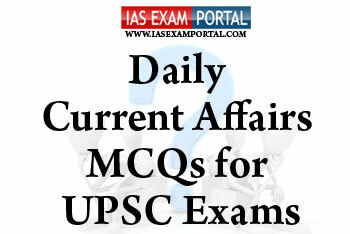 Current Affairs MCQ for UPSC Exams - 19 JANUARY 2019 | IAS EXAM PORTAL - India's Largest Community for UPSC Exam Aspirants. 1) This programme meant to provide for the welfare of areas and people affected by mining related operations. 2) These projects/ programs will be complementing the existing ongoing schemes/projects of State and Central Government. 3) The Pradhan Mantri Khanij Kshetra Kalyan Yojana (PMKKKY) will be implemented by the District Mineral Foundations (DMFs) of the respective districts using the funds accruing to the DMF. Q2. Blackroot rot ,Escobilla,stem canker etc are dieases affecting which of the following crops in India ? Q3. Which of the following statements regarding India’s current debt portfolio are true ? 1) Debt/GDP ratio and interest payment to revenue receipts in total debt indicate that the debt profile of the Government is comfortably placed in terms of debt sustainability parameters and is consistently improving. 2) Government is primarily resorting to market linked borrowings for financing its fiscal deficit. 3) As a percentage of GDP ,India’s external debt is more than that of its internal debts. Q4. With respect to the ISRO’s Young Scientists Programme ,which of the following statements are true ? 1) Under this programme, 3 students from each state and UT will be selected for ISRO programme for one month during which they will visit ISRO centres, interact with senior scientists and will have access to Research and Development facilities. 2) The students will be able to conduct R&D at the incubation centres set up in various parts of the country. 3) All expenses of the programme will be borne by the respective state governments. a) The acquiring of 36 rafale aircrafts by the defence ministry. b) The project to bring in on- air wifi services to all passenger aircarfts by civil aviation ministry. c) Construction activities undertaken by Border Roads Organisation in the north eastern parts of the country.